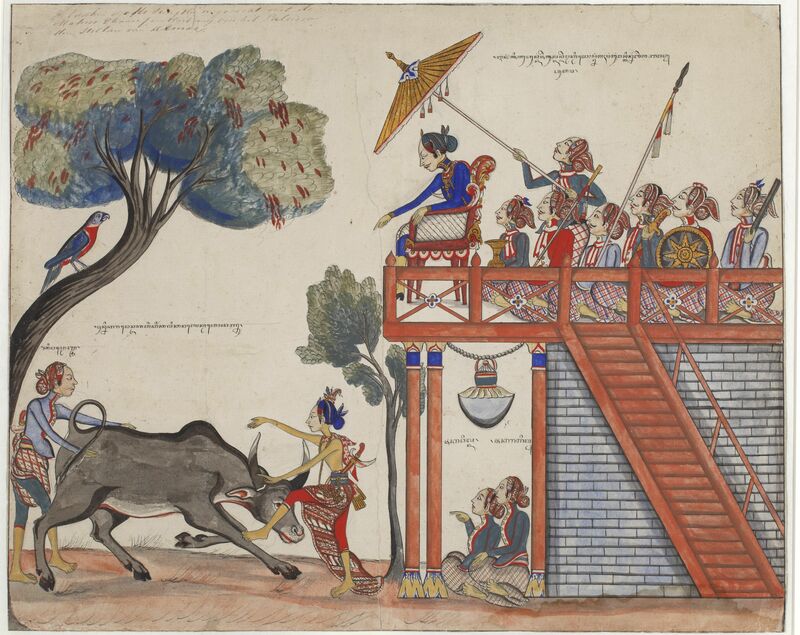 Recently Leiden University Library acquired a fine nineteenth century Javanese polychrome and guilded drawing, depicting an episode from the legendary and heroic life of raden Jaka Tingkir. The scene is set in a country estate of the sultan of Demak, a principality at the North coast of Central Java. Seated on a platform with his retinue behind him the sultan watches the dramatic scene in the foreground and points at it. Jaka Tingkir is killing a wild buffalo in an almost supernatural way by hitting it at the head. The graceful, seemingly dancing pose of young Jaka Tingkir does not give the impression that he is about to kill the animal and in what way. According to the Dutch caption a 'fight' takes place while the Javanese caption mentions a 'blow on its head'. The details of what happens exactly and under what circumstances can be found in Javanese literature. In the Babad Tanah Jawi (Chronicle of Java), for example, the life of Jaka Tingkir is told from his birth onwards. Soldier in the service of the sultan of Demak but fallen into disgrace, Jaka Tingkir wins back the confidence of the prince by this deed, which is all the more heroic as the buffalo had wounded and killed already many people. For three days and nights nobody had been able to kill the animal, not even the soldiers of the sultan who 'had been trained to deal a blow with a flat hand to a bull and to crush the head in one blow so that it died'. After this victory Jaka Tingkir was restored to his previous state by the sultan and made head of his army. Raden Jaka Tingkir did really live, in the 16th century. Precisely because he played a major role in modern Javanese history his (legendary) life was written down in the Babad Tanah Jawi,'the history of the princes of Java starting from the Prophet Adam', and other Javanese chronicles. Although legend and reality are difficult to discern in the Javanese sources some facts are known and cleared up by Portuguese sources. These confirm that he was sultan of Pajang (near Solo in Central Java) where he reigned as Sultan Adiwijaya from 1546 onwards and died in 1586 or 1587. He was the founder of the first of Central Java’s inland Islamic kingdoms.